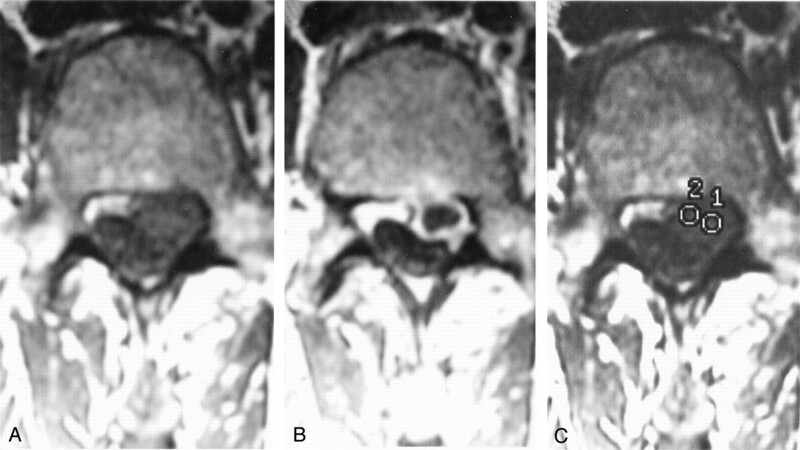 Axial images of a patient with confirmed recurrent herniated disk. A, Axial image obtained before the administration of contrast medium. B, Axial image obtained 5 minutes after the administration of contrast medium. C, Axial image obtained 20 minutes after the administration of contrast medium shows the placement of a cursor to measure disk and scar enhancement. 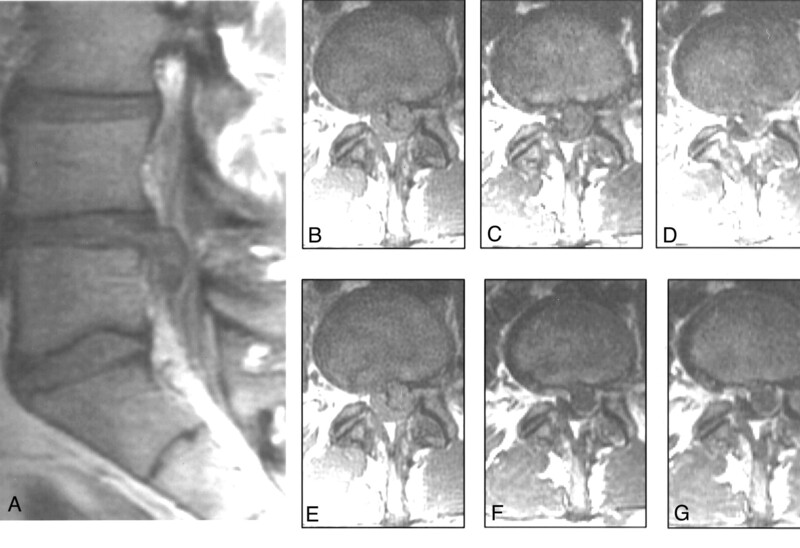 Sagittal unenhanced T1-weighted image (A) and axial images (B–G) obtained in one patient. B, C, and D were acquired before (B), 5 minutes (C), and 20 minutes (D) after the IV administration of nonionic contrast material. E, F, and G, were acquired before (E), 5 minutes (F), and 20 minutes (G) after the IV administration of ionic contrast material. Graph shows contrast enhancement of disk and scar from gadopentetate and gadodiamide in patient 3. Graph shows average enhancement of disk and scar with gadopentetate and gadodiamide at 5 and 20 minutes after the administration of contrast medium. Graph shows disk enhancement as a proportion of scar enhancement for gadodiamide and gadopentetate at 5 and 20 minutes after injection.